My maternal second great grandmother Margaret DeVane was born September 26, 1826, in Bulloch County, Georgia, to Francis Devane and Frances Giddens (yes, her parents have the same name). Margaret was one of at least eight children. Her siblings were Priscilla Ann (1816-1904), Tabitha (1822-1897), Thomas (1824-1902), Rebecca Jane (1831-1859), Patrick (1834-1862), Benjamin Mitchell (1835-1912), and William (1838-1909). Lowndes County, Georgia, in 1830. It was formed from Irwin County in 1825. Lowndes and Berrien counties in 1860. Berrien was formed from part of Lowndes County in 1856. Margaret married William in Lowndes County on June 30, 1845, when she was nearly 19 years old. She gave birth to nine children: Priscilla Ann (1847-1920), Rebecca Jane (1849-1849), John Taylor (1850-1920, my maternal great grandfather), Elizabeth (1853-1936), William Patrick (1855-1922), Benjamin Hill (1858-1936), Francis (1860-1915), Martha Leona (1864-1900, for whom my grandmother was named), and Margaret Beulah (1867-1946). 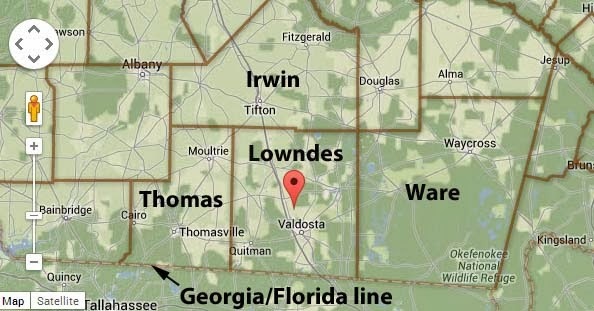 Margaret and William eventually moved to the town of Valdosta, the county seat in Lowndes County, where several of their children were living. Margaret died August 18, 1893, and William died in 1903. Both are buried in Sunset Hill Cemetery in Valdosta near several of their children. Folks Huxford. Pioneers of Wiregrass Georgia, Volume V. Self published, 1967. Second Printing, 1970, 366-367. I agree, no story is too small. Your story on Margaret DeVane was very interesting. I still can't imagine having so many children. You did a great job telling her history. Thanks Bernita! I can't imagine having that many children either.